The smart and sleek F3800 delivers a high-performance, close shave every time. 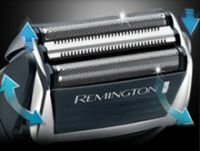 Shaving system Engineered for the optimum angle to deliver a fast, close, smooth shave with no irritation. Contour-following Specially designed optimised blade cutting systems for a fast and efficient result. To Recieve updates and possible rewards for Remington F3800 please sign in. To Recieve updates and possible rewards for Trimmer, Clipper & Shaver please sign in.